For NEEDTOBREATHE, the first year of their second decade in the music business might have been their best yet. Consider how they feel now that their All The Feels Tour 2017 has just wrapped in Music City. It wasn't that long ago that Bo and Bear Rinehart - the brothers and founders of the South Carolina based "soft folk rock" progenitors were thinking about shutting down operations. So, how did they go from that thought to playing to a sold-out crowd on Sunday, December 17, 2017 at the revered Ryman Auditorium in Nashville, Tennessee? All The Feels 2017 took place over three very different legs of the tour that found the guys "Under the Stars," "Electric" and, for the first time, "Acoustic". N2B brought their act to the best amphitheaters in the country where they shared a stage with Gavin DeGraw. The Electric nights featured special guests in some great rock clubs presented as "More Songs, More Ways". The Acoustic leg wrapped up in Nashville and gave their fans the intimate experience they have been requesting for years. 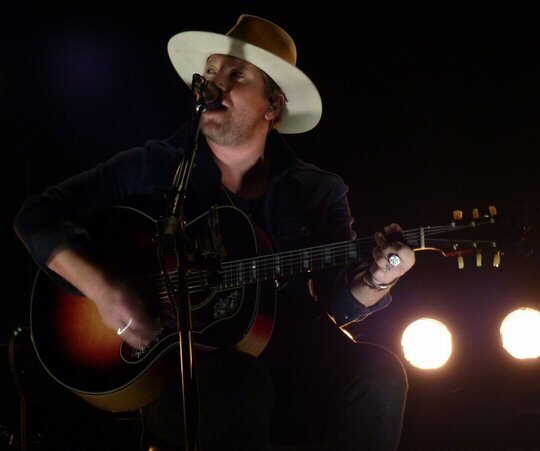 It was shocking to hear that NEEDTOBREATHE almost called it quits in 2016 ten years after the release of their critically-acclaimed debut album Daylight on Atlantic Records. Back then, Laura and I ran an online music portal for indie and unsigned artists and we weren't that accustomed to receiving mainstream product in the mail. Yet, this item did arrive via parcel post and it remains one of our favorite recordings to this day. Due to increased editorial activities that included receiving dozens of weekly press packets and covering several shows a month for that business, I somehow missed the news about their follow-up, 2007's The Heat. I did not, however, lose touch with the quality quartet for long. While shopping in a major chain in 2009 I stopped everything upon hearing what I believed were the distinct vocals of the band's lead singer coming from the store's overhead speakers. Parking myself under one it was then that these words "Just how much air will I need to breathe" were heard from on high. I learned later the song was "Something Beautiful" from their The Outsiders record. "Haha," I thought to myself, "they name checked the band!!!" and I was back on board big time from that moment on. So, the word is that "soft rock band from South Carolina" as they called themselves from the stage in Nashville almost took their last breath in late 2016 due to frustration, squabbling and the not unexpected special type of sibling rivalry that takes place when you put two strong personalities in places of power inside of a rock band. Just ask fans of Oasis or The Kinks how that's been known to play out. But the award winning and Grammy nominated band did the extraordinary instead. They set out on an excursion that would cement them as a national treasure. They would return to several cities with repeat visits during the undertaking and this was the group's second headlining slot at the Ryman in as many months. 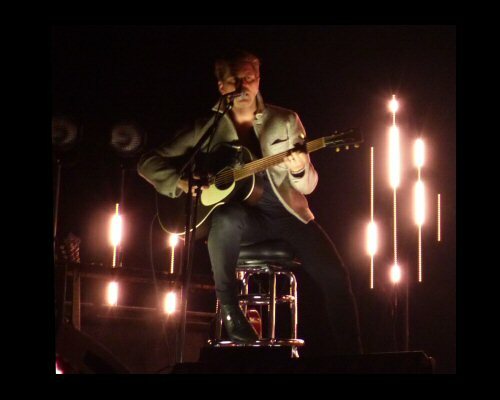 As for the show the darkened theater made perfect sense for a stripped down, acoustic set of the songs which brother Bear announced they had whittled down to a setlist list of just over 50. In Nashville the faithful got a song Bear said he wrote as a teenager but it was really a cover of "Stand By Me" that started slow before building to a thrilling finale. In a live setting the long-haired longtime bass player Seth Bolt emerged as a secret weapon with his sweet high range and commanding falsetto that drew a lot of screams from the lady fans all night long. Brother Bo was "bodacious" as one fan called out with sturdy chops throughout the night. At one point Bear announced that an Uber driver in Music City pegged them as a "vocal" band to which Rhinehart added, "with redneck accents" to much laughter. There was a moment when the quartet were singing - the rest of the instruments were cut from the mix - and a heavenly sound emerged that was both Beach Boys and Pepper-era Beatles yet somehow even more transcendent than those classic rock and pop legends. NEEDTOBREATHE is still a relatively unknown element not quite as popular as air just yet throughout the land. But, they have amassed an incredible following over their first ten years through a variety of means. First, they have created strong relationships within the industry landing a 2011 opening slot on a Taylor Swift tour. Their friend Gavin DeGraw - who sang on the hit single "Brother" - joined the guys on stage to perform that as the encore and last song of the tour. Another guest slot by Drew Holcombe and the Neighbors and a shout-out to East Nashville's Will Hoge proved N2B to be gracious hosts. Prominent placement in film and television has also helped to build a devoted core who were scooping up merchandise at the Ryman in the longest queue we have ever seen at the hallowed hall to buy band related goods. A little regional pandering in the form of two state themed songs hasn't hurt their cause, either. "Oh, Carolina" and "Girl Named Tennessee" were both played on this night with the latter almost tearing the roof off of the Ryman. Wow! No sooner did NEEDTOBREATHE emerge that they were quickly labeled Christian music. According to published reports the band would like to shy away from this brand in order to reach the largest audience possible. Still, before the show we picked up two of their current releases in Nashville at the bright and shiny just opened flagship Lifeway Christian Store in the now under construction North Gulch region of the city. For $5 each we got the new Hard Love outtakes and 2014's extra-spiritual Rivers in the Wasteland - albums that both were prominently featured during their showcase at the vaunted venue. Whatever the case may be the association with the religious cause in the long run has clearly helped get a substantial amount of bodies in the door for the South Carolinians. 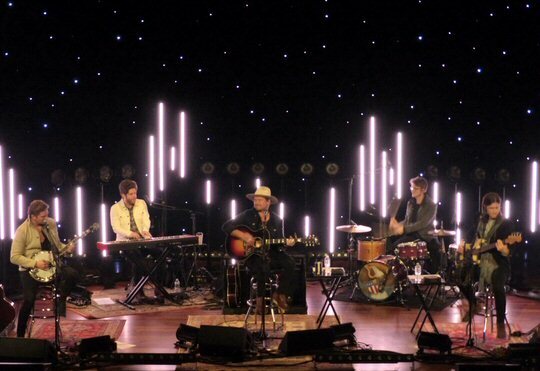 With their stunning and unforgettable performance at the Ryman Auditorium the southern rockers NEEDTOBREATHE appear to have found their redemption in a most fitting concert hall that is also known as "The Mother Church of Country Music". With their solid past behind them they look ready to break out of their cages to now fly to even greater heights in the future. We'll be watching as they do. After a stunning "All The Feels" excursion we sure hope they don't feel the need to break up the band again. A breather we can understand but not for too long. 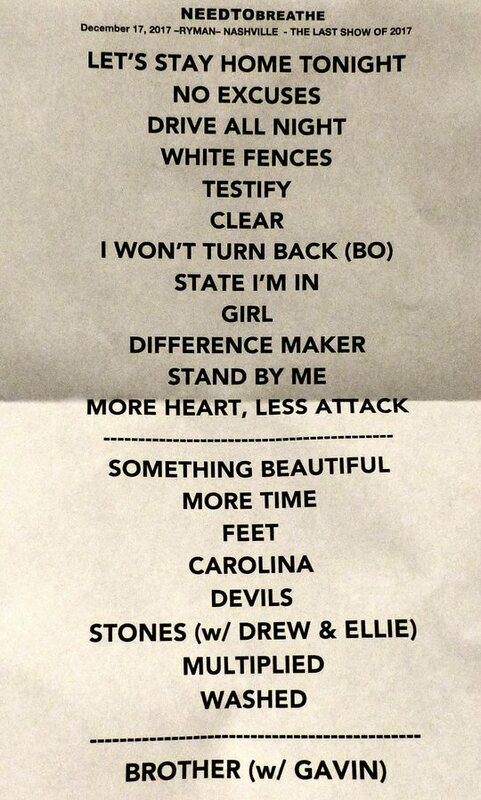 We need more NEEDTOBREATHE.